1. Slack (Free) - Communication is key when working, and Slack is one of the best ways to "talk." It offers real time messaging, alongside file sharing, inline images and videos, and perhaps best of all - integration with many of the other collaborative services listed here. Backed up with powerful search tools, you’ll always be in the know when it comes to your latest project. 2. Trello (Free) - Trello works as a kind of collaborative to-do list for all kinds of things. You can use it just as easily to list out ideas for yourself, as you can when using it to assign tasks to co-workers. It’s simple to use, with options available for adding photos and videos to illustrate your point. Best of all is its flexibility meaning you can use it for personal projects, just as easily as you can for work. 3. Dropbox (Free) - Collaboration isn’t just about being able to chat wherever you are. It’s also about easily sharing files. Dropbox is very useful for that purpose, making it simple for you to share files of any kind with others, even if the other person doesn’t have a Dropbox account. Being able to back up your important files is an added bonus. 4. Flow Chat (Free) - Flow Chat works a lot like other collaborative chat apps, but it has one handy advantage. Want to simply agree to a message, and quickly? Hit the like button as if you’re using Facebook, and you’ve just saved valuable seconds replying fully. Being able to combine files, deadlines and discussion is always an advantage too. 5. Dapulse (Free) - Dapulse’s focuses big picture involved within a project. Using a unified view, all members within a team can easily see what’s expected of them, as well as of others. That means they’ll feel empowered and part of something bigger than their own individual tasks, potentially boosting efficiency. 6. Intellinote (Free) - For a team effort, you’ll eventually need to pay a subscription fee to get the most out of Intellinote, but it offers plenty of reasons to do so. You can easily manage projects and tasks, while also sharing files, and even hosting video meetings through the app. It all promises to be intuitive, ensuring you don’t need to gravitate to any other app. 7. DropTask (Free) - DropTask is for when you need to organize various tasks within a project. Using a form of Venn diagram, you can co-ordinate efforts, slotting in various tasks for individuals, and determining where things overlap. You’re limited to up to 5 projects and 1 other team member with the free version, but that gives you insight into knowing whether it’s worth paying the $65 to upgrade to the unlimited version or not. 8. 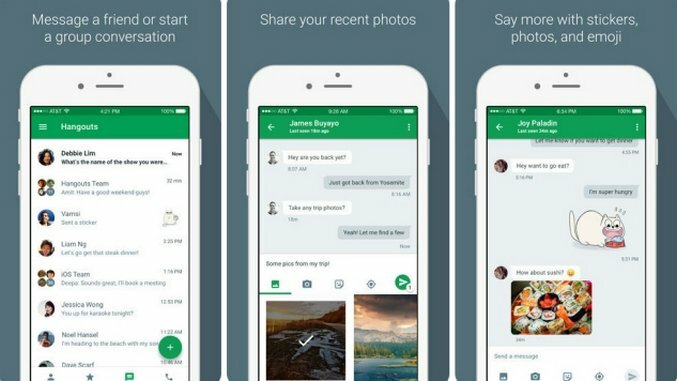 Google Hangouts (Free) - Want to make a voice or video call before switching straight back to text? Google Hangouts is ideal for that. It’s lighter than other communication tools, but given that pretty much everyone has a Google account by now, it’s certainly convenient. You can lighten the mood with animated GIFs, emojis and stickers too. 9. Asana (Free) - A powerful team tracking tool, Asana makes it simple to create and follow tasks, divide projects up into smaller segments, before sending them to team members to get to work on. It offers free and unlimited use for up to 15 people, meaning it’s ideal for small businesses and projects. 10. Basecamp (Free) - A well known name in the field, Basecamp has been useful for many years now. You can easily communicate with various groups, ensuring you have client feedback in one place, while colleague conversation elsewhere within the app. It’s the little things like the ‘do not disturb’ mode and the automatically formed reports that ensure this is a great all-rounder. An increasing number of us work away from an office. Whether it’s because of regular business trips or simply because you work from home, there are going to be occasions when you need to collaborate with work colleagues through technology rather than in person. These days, you don’t even require a desktop or laptop to do this, with a growing selection of apps for your phone or tablet to take advantage of. Here are 10 of the best apps for collaborating with your work team.